Now that we've seen Ep 3 of Hwayugi, aks A Korean Odyssey , wherein Actor Jang plays the God Peacock opposite Cha Seung Won's Woo Ma Wang, another god, who works as the CEO of an entertainment outstanding in their respective roles and the chemistry between them is undeniable. But perhaps what makes JKS' short cameo so delightfully comedic, aside from his superior acting, is the song, You are My Destiny , that the sets the scene. No matter how you think about it, that song transforms an ordinary scene into something both especially comedic and memorable...and only JKS, with his irreverent wit and talent, can pull off the character befitting that music...and so splendidly play counterpoint to his senior, Cha Seung Won's character. 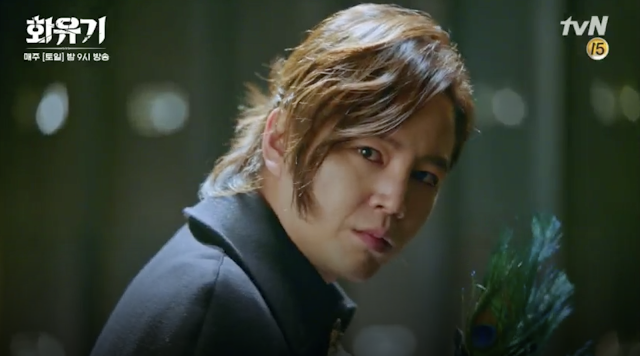 Now TvN has aired the behind-the-scenes portion of JKS' cameo for us to see. It's cute; it's funny; and it's totally JKS. Moreover, we can see the on-screen magic that the two professional actors create with their understanding of the roles they play and their ability to become those character. Thus far, these two outstanding actors really make the drama. I wish we could see more of them together on-screen.